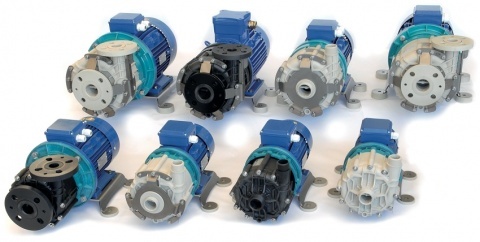 ROUTE pumps are available, either in magnetic drive construction, TMR models, or in traditional construction with mechanical seal, ZMR models. The TMR magnetic drive pumps, offer , with the specific version “R”, prolonged safe dry running. The objective of ARGAL was to eliminate, in case of dry run, the front and rear friction retaining only the friction due to radial rotation. This has been possible by a propieatry an innovative use of magnetic fields, conceived and developed by our own internal research team and patented internationally. The new system (optional) holds the impeller in neutral position, without axil contacts, as soon as main hydraulic flow drops.